Ernesto Garcia is a high end, award-winning residential interior design firm in Phoenix, Scottsdale, & the rest of Arizona. Boasting a broad portfolio ranging from contemporary to traditional styles. Theresa Franklin, ASID is an award winning nationally certified interior designer who is passionate about creating and renovating spaces to forge the ultimate experience for each space. Your investment in design services upon hiring this industry expert will provide you with problem solving guidance, helping you avoid costly mistakes and ensure that your project runs smoothly with the desired results. Jonelle Davis of Davis Design Group creates timeless client-specific design solutions with emphasis on beauty, comfort and budget. *Authorized R.D. Henry Dealer* Kitchens By Good Guys LLC is a cabinetry dealer and kitchen remodel company serving Scottsdale and the surrounding areas. 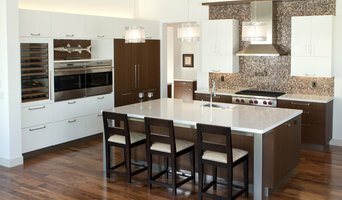 Our skilled team of designers and craftsmen specialize in kitchen design and remodeling projects. Regardless of your aesthetic, our team has the experience and expertise to capture your dream kitchen in design, and guide you through construction. We believe that the remodeling process can be an exciting lifestyle change. Over the years, we have built up a broad base of loyal clients in and around the Scottsdale area, who continue to refer family and friends. We carry several cabinetry lines, making sure your unique style is covered. Anywhere from traditional to modern, we can help you find the perfect cabinets for your kitchen. Thank you for considering Kitchens By Good Guys LLC, and invite you to tour our gallery of projects. Grand Canyon Home Supply was founded in Phoenix, AZ with the idea of creating a home remodel store that specializes in the main essentials of home remodeling; Cabinets, Flooring, Granite and Lighting. *Hunter Douglas Authorized Dealer* Interior designer, Yvonne Wyman will inspire you with new products and timeless design that will spark a new spirit of imagination for your home or small commercial space through our showroom. Planning a project? Kitchens typically 70,000-100,000 and beyond. Master Baths typically 50,000-100,000 and beyond. Guest baths typically 25,000-35,000 and beyond. Powder rooms, mud rooms, laundry rooms typically 15,000-20,000 At Fantasia Interiors you will find more than great window coverings. Whether you are shopping for a single window treatment, redecorating your entire house or seeking the solution to a complex design challenge, you'll find great people who have the knowledge and expertise to help you put it all together. Fantasia Interiors has proudly served Fountain Hills, AZ and the surrounding area for over 32 years. Locally owned and operated, taking a long-term commitment to the community seriously, they offer the highest professional products and services. Call Fantasia Interiors for your next design project. Licensed General Contractor, Interior Design Studio with two locations on NW and also Downtown. Offering are a full service one stop do it all showrooms. Interior Design for Luxury Custom Homes Integrating classic detailing with the restraint and order of traditional and modern design. Regardless of your aesthetic, our team at Good Guys Remodeling LLC. has the experience and expertise to capture your dream in design, and guide that through construction. Redesign of existing homes, kitchens and baths. Reviewing the scope of work and costs to fairly evaluate the price of the project. I am a design / remodel consultant with 35 years experience and 12,000 projects behind me. That may be experience that benefits you in not only design but cost savings as well. 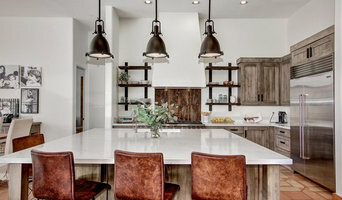 Best of Houzz Award Winners, our professionally certified project team works for successful homeowners to deliver on-time, on-budget "WOW" results. We'd love to hear about your project! *Authorized DuraSupreme Cabinetry Dealer* ABT Home Renovations & Design Showroom is a family-owned, licensed remodeling contractor serving Phoenix and surrounding metropolitan areas. Since 2003, ABT has delivered quality renovations on a variety of interior and exterior home improvement projects specializing in Kitchens, Bathrooms & residential Construction. ABT is the one-stop-shop to handle all your home improvement needs. As a full-service provider, we offer design, material selections in our Showroom, blueprints & permitting, installation and construction services. Interior designer, Yvonne Wyman will inspire you with new products and timeless design that will spark a new spirit of imagination for your home through our showroom. Contact Yvonne today! The Avonti Design Studio is a place where you can start turning your vision into reality. The Avonti Design Studio has thousands of samples including cabinets, counters, tubs, showers and hardware. *Authorized Wellborn Cabinetry Dealer* Ranked #1 Full-Service Remodeler in Arizona by Remodeling Magazine - 2016, 2017, 2018 Todd Whittaker Drywall, Inc. (TWD) is a licensed, bonded and insured full-service residential remodeling and repair contractor serving the entire Phoenix Area. Stop in at our gorgeous remodel showroom in Peoria, Az to get ideas or meet with our design team today. Now you can plan your entire remodel all in one place! While some Homeowners undertake remodeling projects for the express purpose of boosting the value of their home in an expanding housing market, most people do it to increase the beauty, comfort and functionality of their home. Whether you want to create an oasis in the master bath or a lovely area to entertain guests, you ultimately want to create a living space to fall in love with. With thousands of successful projects in our portfolio, we are eager to welcome you to our family of customers. Call to make your appointment today and experience the TWD difference! TODD WHITTAKER DRYWALL, INC. EMPLOYS UNIVERSAL DESIGN CERTIFIED PROFESSIONALS. Scottsdale's Custom Kitchen and Bath Designers. Best of Houzz 2016. Whether you are planning a kitchen remodel or are building a new home, Affinity Kitchens will design a space that suits your lifestyle and reflects the latest advances in design and technology. We aim for quality materials combined with great fabrication and impeccable installation. A well-executed vision is what we build our brand on from the inside out! Grand Canyon Home Supply was founded in Phoenix, AZ with the idea of creating a home remodel store that specializes in the main essentials of home remodeling; Cabinets, Flooring, Granite, and Lighting. Whether moving into a new home or improving their current one, our customers have the luxury of shopping at one location, saving them time and money. Grand Canyon Home Supply offers an array of well-crafted, beautiful cabinets from lines such as GCHS Cabinetry, Oak Craft, and Woodland Cabinetry. We also offer a broad range of flooring options to allow you to unbridle creativity in your home- timeless hardwood and wood look tile, exquisite carpeting, long-lasting porcelain, stylish vinyl, and durable laminate. Whether you seek a warm, refined, traditional style, or a cool urban attitude we have granite, marble, and quartz options to match your cabinet choice and finish your desired look. Grand Canyon Home Supply has experienced specialists available to assist you with each step of your home project- from measuring the space and creating a 3D design, to delivery to your home, and arranging installation. We pride ourselves on our customer service and our attention to detail. At Grand Canyon Home Supply we listen to the desires of our customers to ensure that our products meet their needs, as well as fit their budget. Our number #1 goal is to provide you with a beautiful home remodel that you can enjoy for a lifetime. We offer innovative, functional, and trend setting kitchen and bath design to use our semi- and full-custom cabinetry options for both residential remodel and new construction. We are truly a full service custom cabinet company offering a wide variety of remodeling and new construction products, installation, service, and support. We work with the top interior designers and custom home builders here in Scottsdale, Arizona. Due to the extensive detail required, we've become known in the industry as experts in contemporary design and installation. In addition, we've become a dealer for just a handful of select high quality custom cabinetry lines including Bellmont and we're now the valley's exclusive dealer for Plato Woodwork. To see more, our cabinet shop and showroom is located conveineiently off Raintree Rd and the 101 in North Scottsdale... call us or stop in for a quick tour or to learn more! Kitchini (DBA Trenz Group) provides value-driven solutions, high-end custom Italian products, service focused on attention to details and affordable for a luxury brand. Experience Kitchini today by calling us at 480-945-0094. Achieving flawlessly functional and attractive kitchen and bath design in Fountain Hills, AZ requires a professional who specializes in these spaces. Not only do these rooms see the most action of the house, but they require the most planning and attention to detail. When designing them, a bath and kitchen designer must keep a strong focus on the homeowner's wants and needs while also considering things like potential resale value. Read the tips below to learn how to choose the perfect Fountain Hills kitchen and bathroom design professional for your home project. What does a Fountain Hills kitchen designer or bathroom designer do? A kitchen and bath design professional in Fountain Hills, AZ knows to take all of these crucial points into consideration and can help plan the layout, materials and overall look and feel of either of these rooms in your home. Kitchen designers, as well as bathroom designers, are constantly staying on top of trends in the ever-changing industry. The designer also knows the best layout for your room, and can configure the layout for optimal functionality and utilization of the space. In the kitchen the refrigerator, stove and sink should be laid out in relation to one another, and it should be seamless and easy to move from one to the other. A Fountain Hills kitchen and bath designer will know how to work with a contractor and architect to plan the flow of the room to work best for your needs. Here are some related professionals and vendors to complement the work of kitchen & bath designers: Kitchen & Bath Fixtures, Appliances, Tile, Stone & Countertops, Cabinets & Cabinetry, Woodworkers & Carpenters. Before you talk to bath and kitchen designers in Fountain Hills, AZ, consider how you will use the room. For your bathroom, is it necessary to have a bathtub for bathing kids or pets, or would a shower suffice? Perhaps all you need is a half bath for downstairs or a smaller guest bath for occasional use. Similarly, for kitchen renovations consider your cooking habits. Do you eat out every night but need a space to entertain in? If so, a smaller kitchen might be fine for you, with a space devoted to wine storage or a bar, whereas others might prefer a bigger stove or extra cabinets. When interviewing Fountain Hills kitchen and bath designers, make sure to share these habits so they can best fit the room to suit your needs. Find a Fountain Hills kitchen designer or bathroom designer on Houzz. Narrow your search in the Professionals section of the website to Fountain Hills, AZ kitchen and bath designers. You can also look through photos in Fountain Hills, AZ to find a kitchen or bathroom you like, then contact the professional who designed it.